“Prof. Arun K. Somani holds a bachelor’s degree in electronics engineering from BITS Pilani in 1973. He subsequently did his M.Tech. in computer engineering, from IIT Delhi in 1979, and M.S. and Ph.D. in electrical engineering from McGill University, Montreal, Canada in 1983 and 1985, respectively. He is currently Anson Marston Distinguished Professor of Electrical & Computer Engineering, Associate Dean for Research, College of Engineering & Philip and Virginia Sproul Professor, Iowa State University, USA. He has made pioneering contributions through his research in the areas of System-Level Diagnosis, Fault Tolerant Computer System, Reliability Analysis Tools and Techniques, Managing Soft Faults in Computer Systems, VLSI Systems, Proteus Multi-Computer System, GPS-Denied Navigation and Augmentation, Image-Based Navigation, Architectures, Algorithms, and Fault and Attack Management in WDM networks etc. His research contributions have a great recognition amongst researchers as evident from having a citation indices of ~9,000, H-index of 48 and i10 index of 168. He has mentored more than 40 Ph.D. students, 85 master’s students and has more than 350 publications. He has co-authored ~20 books and book chapters and holds 11 patents. He has developed, designed and implemented the Proteus multi-computer system – a fully reconfigurable high performance computer system – for computer vision applications using mathematical morphology for Coastal Navy. 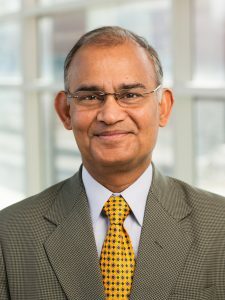 His research outcomes, architectures, algorithms, and tools and methods developed for analysis and education have been and are actively being utilized by leading companies such as Boeing, Singapore Defense, Honeywell, GE Locomotive Division, Lucent, Rockwell Collins, Lockheed Martin, and several universities. He has received widespread recognition for his extraordinary contributions to the field of teaching and research. He is recipient of prominent honors/awards for his research and leadership/service roles including Distinguished Professor, 2007; Department Leadership, 2008; Mervin S. Coover Distinguished Service Award, 2010; first recipient of Philip and Virginia Sproul Professorship, 2014-2019; and first recipient of Jerry R. Junkins Chair Professorship, 2002-2014; all at Iowa State; awarded Eminent Engineer of Tau Beta Pi Engineering Honors Society; elected Fellow of IEEE for “contributions to theory and applications of computer networks,” 1999; Distinguished Engineer of ACM, 2006; elected Fellow of AAAS for “distinguished contributions to the theory and practice of dependable computing and networking systems, including design, development, implementation, and building experimentation platforms,” 2012.